Belgian Blue breeders enjoyed a very successful day’s trading at the Border Belgian Blue Club’s Seventeenth Annual Spring Show & Sale at Carlisle on Saturday 19 May 2007. A new breed record of 30,000gns was set and a further four bulls and one female broke the five figure barrier. There was exceptionally strong demand for the intermediate bulls which was reflected in the average of £4,949.58, with a strong commercial trade throughout the day with buyers keenly bidding on animals which met their criteria. There were 34 more bulls sold on the year to average £4,173.67 plus £73.64. The females were also keenly sought after by both established breeders’ and those looking for foundation stock to start their new herds. The show and sale was kindly sponsored by BBG (Class Prize Money), British Belgian Blue Cattle Society and Border Club (Advertising). BBG also gave £100 to the Supreme Champion and £50 to the Reserve Supreme Champion. The judge, local suckler producer John Hall, Inglewood Edge, Dalston commented that there was a good show of cattle overall and was very pleased with the intermediate bulls but the senior and junior bulls perhaps not quite as good as he expected, with a nice show of females. John made some sound judgements in the previous day’s show as all the top priced animals had been placed in their classes. The breed record was smashed when the female and reserve supreme champion entered the ring and was bid to 30,000gns. Shropshire breeder DA Williams of the Wilodge herd sold Radieuse, an imported daughter of the renowned Gypse sire and out of Opinion. 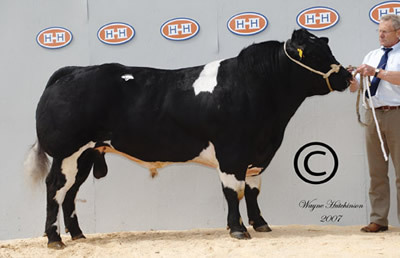 Radieuse was sold in calf to Wilodge Ulex and is already entered for the show circuit this season. The final bid for this sale topper and record breaker came from Paul Walker on behalf of Messrs Crawford of Rathkeeland, Co.Fermanagh, N.Ireland. The same buyer also forked out 12,000gns for the Reserve Female Champion, Wilodge Way To Go, an in-calf heifer sired by Cubitus and out of their homebred cow Pandora, was shown in calf to Wilodge Ulex by Christine Williams. The fifth prize winning bull and single entry from Northern Ireland breeder Jim Sloan, Kilkeel, Co. Down secured the leading bull price of 12,000gns. Ballygrange Alex a powerful 22 month old almost all black bull was keenly bid for but it was pedigree breeders’ Jane & Danny Wyllie, Tamhorn herd from Tamworth, Staffs who secured the final bid. Alex is a son of Woodview Solo and out of a Banquier sired daughter, and is full brother to last seasons Royal Highland Show Male Champion Ballygrange Vinney. The reserve senior male champion, Astbury Alex ET, made the next best price, selling at 11,000gns for the Society Chairman, Jim Barber, Congleton, Cheshire. Alex a 28 month old son of the renowned Sceptre De Bomal and bred from a Baron daughter has successfully served several pedigree cows. He was jointly purchased by Messrs Wood & Hunter of Crieff, Perthshire and Dunmaglass Estate Ptrs of Inverness. Also selling for 11,000gns was a Dafydd bred son, Ballee Ace ET, who stood 1st in his class and was shown by Alan Cleland of Downpatrick, Co.Down, N.Ireland. This eye-catching October 2005 bull bred from Ballee Pauline, a Ridge Dean Mahogany sired cow, sold to DMG Millichap & Ptrs of Port Tolbot, West Glamorgan. Also reaching the five figure mark was a May 2005 born bull consigned by Herefordshire breeder Graham Morgan of the Almeley herd based at Tillington. Almeley Arlequin, a son of Park U Panda and out of their home bred cow Rainbow, sold for 10,000gns to go to DC Rees & Son of Brecon, Powys. Northern Ireland Breeder Richard Mowbray of the Droit herd from Newtown Stewart, Co. Tyrone nets 23,000gns on his Carlisle debut. His top price of 9,500gns came for his 2nd prized bull Droit Acorn ET, a May 2005 son of Affute and out of Springfield Ulanda ET the supreme champion, who sold for 4,600gns Carlisle Premier female show & sale November 2003. Acorn was knocked down to Shepperton Plant Ltd, Bridge Farm, Bicester. Another Dafydd bred son, Springfield Amos ET from regular consignors to Carlisle, Deirdre and Allan Wilkinson’s Springfield stable, Out Rawcliffe, Preston, Lancs. Amos, a 26 month old black and white bull out of the naturally calved Springfield Pepsi stood 1st in his class and was knocked down for 8,500gns to L Raine & Sons, Coach & Horses, Bowes, Barnard Castle. A few lots later Eileen Wilson, White Hills, Scorton took her first prize winning bull Aprilton Arnie into the ring where he sold for the same money, 8,500gns to pedigree breeder J McGarva, Nether Abington, Biggar, Lanarkshire. Arnie, an April 2005 blue coloured bull is a son of Gib Van Het Negenbond and was born naturally out of a homebred cow Tessie, a tremendous Affute daughter. Also hitting the high spots at 8,000gns was Norton Archie ET, a two year son of Baron Du Bois Bauloye and out of Bannister Naïve. 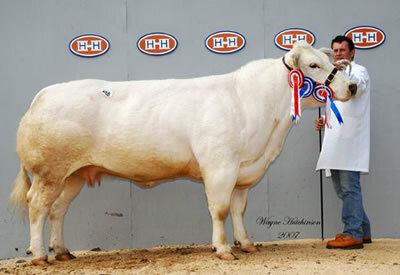 This third prize winning bull is no stranger to the show ring as he was shown six times last year from just 12 months of age, winning junior bull classes five times, one reserve interbreed, two championships, one reserve champion, one reserve male and an interbreed championship group of four with his sister included. Archie travels to Ross-shire for A & P Munro, Caplich Farm, Alness. Matching that price was the reserve intermediate and reserve overall male champion, Solway View Antonio ET from Border Club enthusiast Kevin Watret, 25 Northfield Park, Annan who was selling his first homebred bulls at Carlisle. Kevin also won the Border Club Special trophy for the highest priced animal owned by a member of the Club. AE Neachell & Son, Shrubbery Farm, Daniels Lane, Aldridge, Walsall bought him. Then later on in the proceedings they purchased the first prize winning senior maiden heifer for 7,000gns. Annanwater Aqua ET, a two year daughter of Serum D’Anloy and out of Springfield Tinga, was bred and exhibited by BK Ryder, Newton Farm, Moffat. 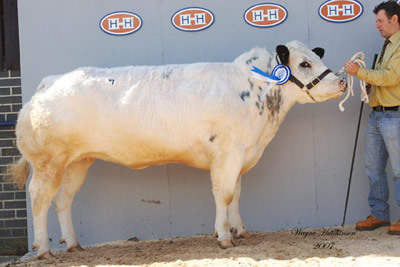 Aqua was reserve female champion at the Border Club’s 7th Annual calf show February 2006. Two second prize winning bulls sold for 7,500gns, the first through the ring was Navac Apache ET, another Dafydd son out of the herd’s show cow, Loyaute ET Du Fond De Bois, from Maguire Livestock Service, Rishton, Lancs and sold to C & JM Kearton, Museum View, Barnard Castle, Co. Durham. Next through the ring on 7,500gns was the best from the Belfield family’s Boothlow consignment, from Lower Boothlow Farm, Buxton, Derbyshire. Boothlow Allan ET, a July 2005 son of Affute and by the Hazelwood Freshman cow Boothlow Rachel was purchased by TM & EE Williams, Nantygeifr, Llanidloes, Powys. Another Northern Ireland success came in the form of the single entry from respected breeders’ Martin Bros, Ashdale Farm, Newtownards, Co. Down. Springhill Active, a two year son of Arlequin Des Peupliers and out of their homebred cow Tara was placed 1st in his class, then went on to win the intermediate male, overall male and supreme championship when judged the day before. The judge John Hall, backed his judgement by purchasing Active his supreme champion for 7,200gns. D Small’s “Ridge Dean Alligator ET” 7,000gns to R Ivory, Ballingdon Farm, Gaddesden Row, Hemel Hempstead, Herts. 4th in class 10. John H Collinson’s “Bridgend Blues Alexander ET” 6,800gns to B Wilson, Whitecross Farm, Haughton, Stafford. 3rd in class 7. DA Williams’ “Wilodge Ulex (SR) ET” 6,500gns to JC Innes & Sons, Dunscroft, Huntly, Aberdeen. 3rd in class 1. RE Carruther’s “Valley Adagio ET” 6,500gns to W Robson, High West House Farm, Tow Law, Bishop Auckland, Co.Durham. 1st in class 7. K Belfield’s “Boothlow Archie” 6,100gns to DJ Evans & Sons, Bryngwyn, Abermeurig, Lampeter, Ceredigion.